Cooking 4 all Seasons: Carrot Masala Dosa, Paneer Cheese Pizza Dosa, Egg Dosa and Paneer Butter Masala on Dosa ~ 101 Dosa Varieties! Carrot Masala Dosa, Paneer Cheese Pizza Dosa, Egg Dosa and Paneer Butter Masala on Dosa ~ 101 Dosa Varieties! Ok I think this will be my last post on dosas. Not that I have had enough of them. Believe me, in my dictionary there is no such word like No for Dosas. But I have to consider my family too right. Every other day, they are subjected to different versions and each one is highly treated with great expectations of the end result. Let me tell you one thing, all the different varieties that I have tried have all turned out to be simply delicious! I come to the conclusion that anything and everything on or in the dosa, will taste great! For the record, I have posted 28 dosas till date and about 13 after the mela announcement. I feel bad that I couldn't make more. But then of course, I now have so many varieties to try and make it 101 varieties! Coming to these varieties, I finally did what I was planning to make for quite sometime now. Took the dosa batter out and tried making different combinations over it. So it didn't involve making anything new but just a combination of sorts! When I used the Paneer Butter Masala and made a masala dosa, hubby dear was very skeptical. He said there is a limit for creativity and this is stretching too far. But actually it tasted great. Then there was that Carrot and Zucchini Dosa. For the life of me I couldn't understand how this looks or tastes. Finally I read somewhere that its not available out here. Ok, that's fine. So the next option left was to just go ahead with carrot. It came out yummy. The name was no way like this, but I am calling it so. This had a nice soft and crunchy feel on the dosa. As the carrots are fresh, and you have tomatoes chucks to munch on, it gives a different taste all together! 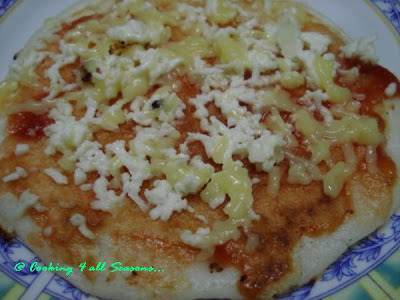 Make a regular dosa, make sure its crispy! Then once the masala is thick, place on one side and fold over it. The dosa become very crisp, so I was able to fold it to just one side. That's Konda lifting the top side for a quick shot! This is another simple one, though much relished by the men of my family! I guess the men have a thing for egg, all my male family members especially have an affinity to eggs. So we end up making eggs in different varieties frequently. 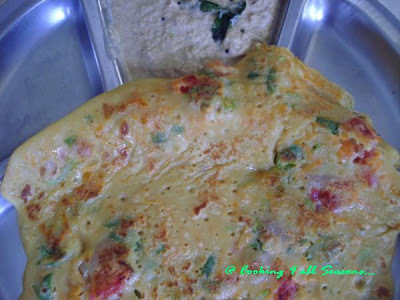 And egg on dosa is very specialty item, though it doesn't involve any cooking, other than making the dosa. 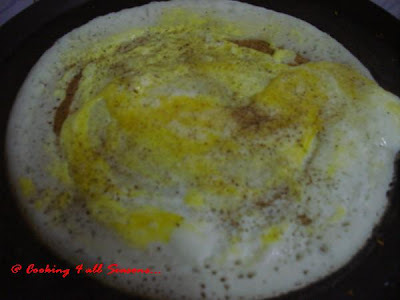 Normally, we beat the eggs together in a bowl with salt and pepper and then pour over the batter on the tawa. But this time, I spread the dosa, you can say I was lazy to do the other way and so broke the egg over it directly. Spread it around using the spatula. Actually for a moment, I thought I will take a sunny side up but hubby dear doesn't prefer it that way. It might be photogenic, but if no takers are there for it, will cook it that way. So flipped to the other side for a min, then back to the top, sprinkle lot of pepper and server hot. 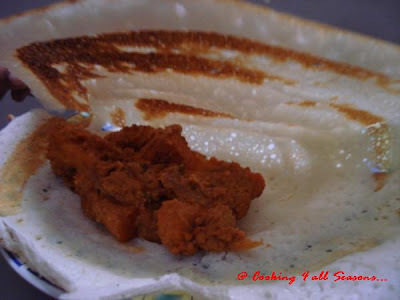 The batter should be little thin, so that it spread on its own to a small size dosas. Once the tawa is hot, take a small ladleful of batter and just pour on the tawa, don't spread it. Sim for a min, flip to the other side. Let it cook for 2 mins. Turn over and then spread little tomato sauce over the dosa, sprinkle grated paneer and cheese. Cover for 2 mins. Don't turn over, as cheese will get burnt. If you like burnt cheese, then go ahead that way. I liked it, rather the first one, got burnt and I liked that taste. You can either toss the paneer cubes, then grate it or else just toss the grater paneer with some masala before adding over the dosas. The varieties are just so many. These make a great one for kids. Konda liked it very much. I had planned on a Dosawich and Burger dosa too, but I guess I have to drop them now!